Keeping your website up in search rankings means adding new content regularly. However, it can’t be just anything that comes to mind. New content has to help people find your website and that means careful planning. You guessed it, you need a Content Calendar. Why have a Content Calendar? Planning blog topics for a year seems a lot of work and it can also feel like a death blow to creativity. What if I don’t want to write about On-Page Search Engine Optimisation this week? Why should I bother creating and sticking with a Content Calendar? Simple. You want your website to rank and your Content Calendar is a key tool to help achieve that goal. The first step is to list keywords and key search terms. 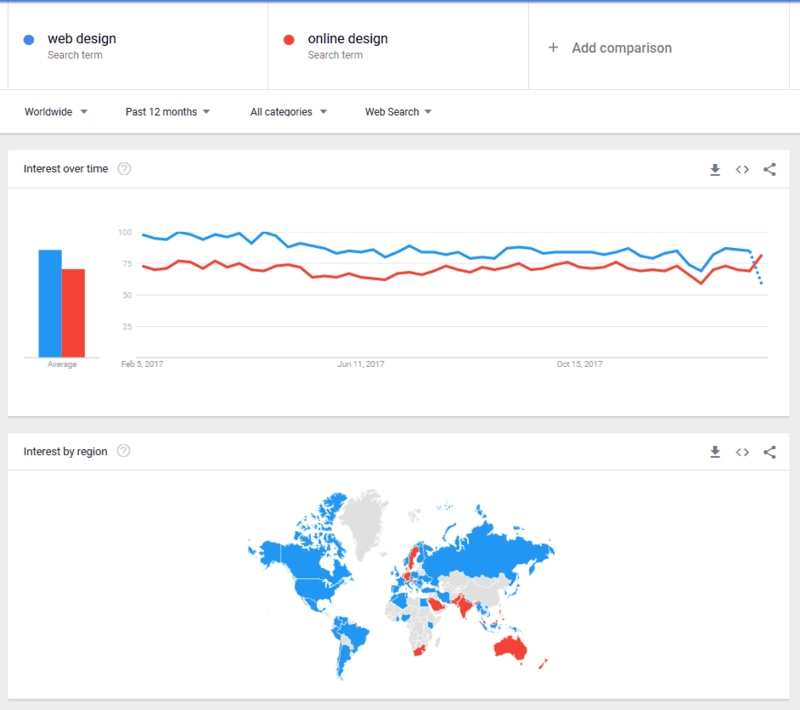 For which words do you want your website to rank? Which search terms? Make a list and be sure it includes your key services and/or products. Next make sure potential customers are using the same keywords you do. 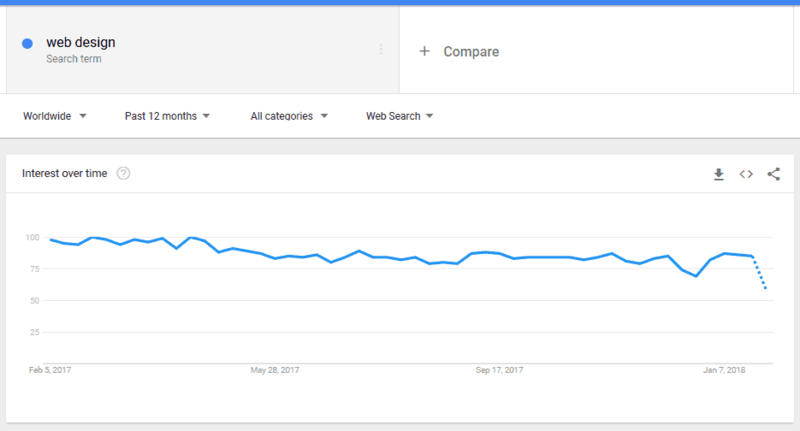 A free tool called Google Trends makes this easy. Now you see which term is more widely used and where. Obviously the more generic search term gets much higher use but which option you choose depends on your target audience. 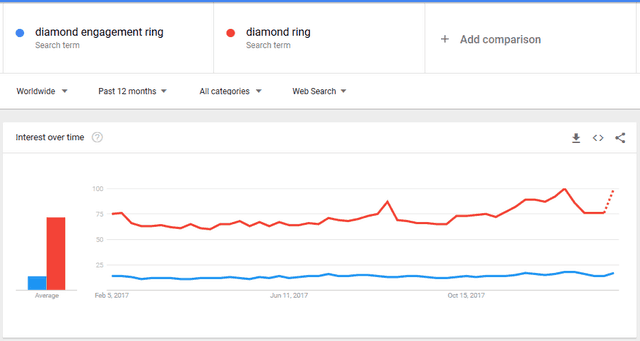 If you sell diamond engagement rings but you also sell other kinds of diamond rings then you benefit from both markets and ‘diamond ring’ is for you. But if you just want to target diamond engagement ring seekers then the more specific term will serve you better. Once you have a keyword list use the key terms to come up with ideas for blog posts. Think of each keyword as the trunk of a tree. What are the branches? One fast way to find out is at answerthepublic.com. Simply go to the site and enter a keyword into the ‘Ask the Seeker’ box. Click Get Questions and voilà. More blog topics than you can shake a stick at. Well … nearly. Another fast way to get blog post ideas is to type your keyword into Google and see what suggestions come up under your search bar as you type. These suggestions are based on real user usage so you know people want information on these topics. You can add another layer to this. Type your keyword and then type ‘for’. So ‘running shoes’ becomes ‘running shoes for’. A new range of possibilities appear which relate to a purpose, an intention, something people actually want to do. Regarding frequency you may find it helpful to have a ‘must-do’ baseline with ‘nice to have’ extras on top. The ‘page plus blog post(s)’ treatment makes a topic more ‘permanent’ or evergreen on your site than it otherwise would be. It also increases the number of pages referring to that topic on your site, which from an SEO point of view makes your site more relevant to that topic. Let’s say you’re a bike shop and you want to your site to rank for ‘electric bikes’. First you do your keyword research and discover users search for ‘E-bikes’ more often than for ‘electric bikes’, so you change your keyword. Next you create a new product page for ‘E-bikes’ under the main product section of your website. You also create a blog post about ‘Electric bikes’ and another blog post for ‘E-bikes’. Now your website has three new pages for these key search terms. It’s essential to use a digital tool to keep track of planning and creating your content (unless you have an experienced cat-herder handy). We use the Project Management tool Asana to assign topics to people and set due dates. Listing each piece of work as a task in one central place helps us manage our team of content creators and keep everyone on track. It also means we can manage the content process right through writing, editing, publishing and sharing. Don’t be put off if you’re a solo blogger, you’ll find Asana (or one of its competitors) just as useful as we do. You need to get content out regularly because both search engines and people notice if you don’t. With this said, it’s fine and necessary to be flexible with topics. Something topical might hit the media, or you might get inspired, or your product or service strategies might change. Keep your finger on the pulse and watch for opportunities. You can always bring the topic you originally planned for this week back on a ‘slow news day’! One simple way to catch blogging opportunities early is to set up Google Alerts for your keywords. When news breaks you can comment straight away and be a leader in your area of interest. Distribution is part of your content calendar as well, so think about how you will get your content seen. Social media and email are the essential baseline distribution channels for your blog posts, but what else? You can republish or share content in any number of ways and places to maximise your audience. Your baseline distribution activity will most likely include sending your blog post out via email and sharing it on the social media platforms of your choice. On top of this, plan to experiment with something new to see how well it works. Let each experiment run for at least two months before you assess the results and decide whether it’s worth continuing.